This is really a one of a kind apartment in central Harlem. It is a duplex apt that features a great open kitchen with everything you need to cook and eat! A large dining room that can seat up to eight, a living room with a sectional sofa bed, flat screen tv with cable, wifi, and bookcase. Great supermarkets near by including Whole Foods. When you enter the apt, you walk into a large open space that leads you through the living room, kitchen, dining room and a back door that leads you into the backyard that has patio furniture, grill and a deck. Great place to have spring/summer/fall breakfasts or winding down at the end of the night. There is also one full bathroom upstairs, and two very comfortable air mattresses that sleep two each. Downstairs you'll find a large sleeping quarter with two queen size beds, and a large full bathroom as well. You can sleep four downstairs, and five upstairs. It’s a great place for weddings, large group trips where private bedrooms are NOT necessary. I have another apt in the same building that sleeps 1-3 guests. All linens, and towels included. I am a real estate agent in NYC. The husband is an entrepreneur who puts too much faith in me! We have two young boys who keep us busy and young. Together we are a strong and passionate team of four who work hard and play even harder! We love Harlem and everything it has to offer, and are forever spreading the word on this amazing neighborhood. When I met my husband over 10 years ago all he talked about was Harlem, he was rootly involved in the rehabilitation of many Brownstones back when no one wanted to be there, and was passionate about owning a part of history. He was very specific about what he wanted, and sent me out in the jungle with his list to find it. And I didn't fail. Five years and two gorgeous boys later, our dream of owning a Brownstone in the historic neighborhood of Harlem came to fruition, and we couldn't be happier to share it with the world. We hope you enjoy the neighborhood, culture and soul as much as we do. We love waking up in the morning and strolling the streets of the city. There is really nothing like it (except a great cup of coffee). The house was perfect for our stay in NYC. We had 9 people staying (7 adults and 2 children) and there was adequate sleeping and eating room. The kitchen and bathroom were VERY minimally stocked - but it was adequate. The house is conveniently located near the express subway, so coming to and from the city was easy. The house was clean and as advertised. Amal did a great job and was very quick to answer my questions before the trip. Our stay was alright but could have been a lot better. The steps going down to the apartment were icy and it would have been nice if they were shovelled (as a safety precaution too). Unfortunately, the hot water heater was also a problem. First day, the water was not hot enough. The following next day, the hot water was totally gone which is really tough to go without in the winter. The space itself was good for a big family like ours. We also appreciated the availability and convenience of the kitchen facilities. The basement was nice and clean but the main floor where the sofa beds were, didn’t seem clean (particularly the carpets and sofa itself). On the bright side, the host, Amal would readily answer all our questions. She was nice enough to refund us a day’s rent for the loss of hot water. In summary, its was an alright stay. The host did her best to alleviate the situation so hopefully those issues would be resolved for the next guests. My favorite NYC home away from home ! Owner is very responsive to any little issues. Highly recommend. 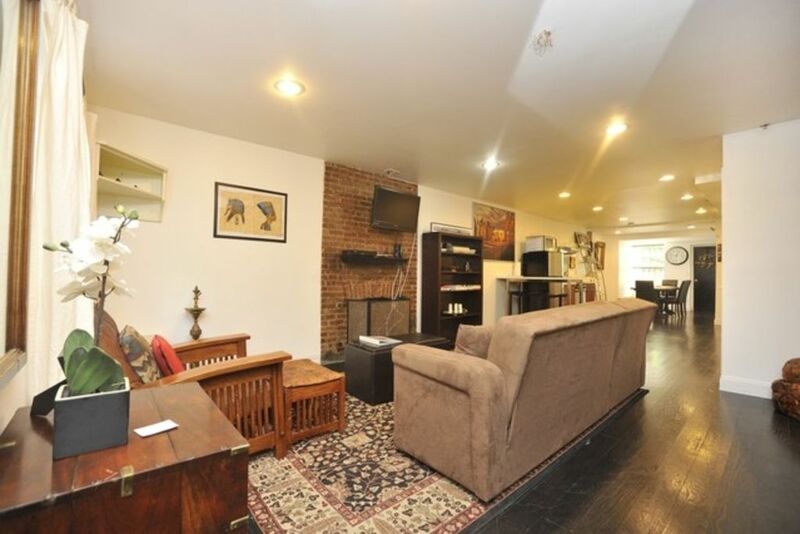 This property was perfect for our family of 5 visiting NYC over Thanksgiving Weekend. So much better than a hotel room for 2 adults and 3 adult children. 2 blocks over had parking for our car for the entire weekend and then 3 blocks from the apt. (very short walk) to the subway which was the perfect way to travel the city. The owner was so helpful and was extremely quick with answering any questions we had previous to getting there and also after we had arrived. Clean, comfortable and great location for us! Highly recommend! This is a nice quiet place to stay about a $15 cab ride from Times Square. Great location for an out of the city break. Having never been to NYC before this was a great location for breaks in the evenings. We spend a great deal of time in the downtown area as most tourists, and having this great townhouse North of Central Park was a perfect location to escape for some peace and quite. Close to the subway made it super easy to get wherever we wanted to go each day, and a short quick walk when returning in the evenings. The house itself was spacious and very very quite. We are light sleepers and never heard a sound. A fun blessing for us was the Gospel music that filled our morning on the Sunday we were there. The church close by was signing loudly and sitting on the back deck area for coffee and listening to the music was so much fun. Amal was very very responsive to every email question, and was a pleasure to rent from. Thanks for a great location. I highly recommend this home if you want to experience New York away from the hustle of most tourists. Also very close to Central Park which my family loved the most.